In April 2017, we introduce our third wave of factory automation (FA) devices built on a Common Design Platform for unified product specification. 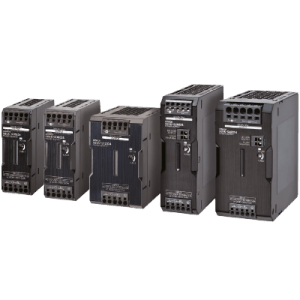 The new products include Switch Mode Power Supplies, DIN rail Terminal Blocks, Liquid Leakage Sensor Amplifiers, and I/O Relay Terminals. We unified the design of the FA devices to save space and enable smaller-sized control panels. Alternatively, these space-saving FA devices enable panel builders to include more components into the panel and increase its control functionality. In addition, the standardized, smaller size of these components, enable easier and faster control panel customization. 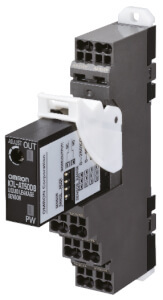 Furthermore, the Common Design Platform includes Omron’s proprietary “Push-In Plus” wiring technology, which combines faster wiring with a reliable connection and outstanding vibration resistance. Previous FA devices built on the Common Design Platform have been adopted on the front line of manufacturing by more than 7,000 global companies. 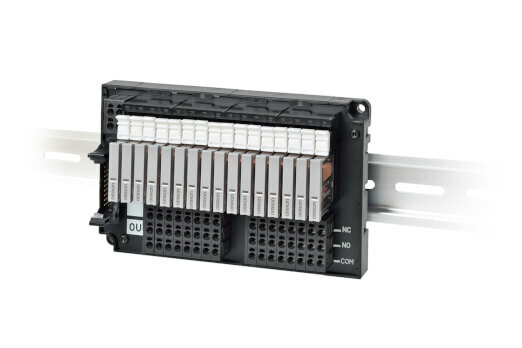 We have applied the Common Design Platform, which saves space and enables faster wiring, to the expanded range of XW5T Terminal Blocks, the G70V I/O Relay Terminals, and the 30W models of S8VK-S Switch Mode Power Supplies, completing the existing line-up of 60,120,240 and 480W models, for wider application. The expansion of the FA devices built on the unified design platform will have a great combined effect achieved by providing a wide variety of devices. 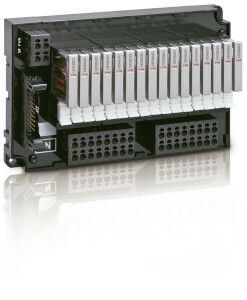 OMRON aims at innovating control panels of customers. Since the component height varies, depending on factors such as power & heat dissipation, the in-panel products are categorized into three main groups with their own specific placement (row) in a control panel: I/O, Control, and Power. Within each category optimized design rules ensure that dead space is reduced and the width between wiring ducts is optimized. For product details, please visit our panel building section. The line-up of the XW5T DIN Track Terminal Blocks with Push-in Plus technology has been doubled from 18 to 36 models. 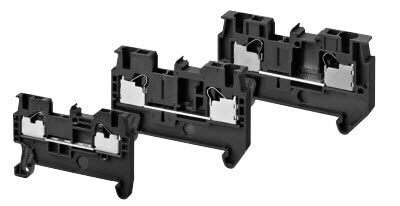 For terminal blocks with a width of 5.2 mm (maximum rated current: 24 A) and 6.2 mm (maximum rated current: 32 A), 1:2 (internal wiring) and 2:2 types (for branching) are added, besides two-tier types for space-saving. 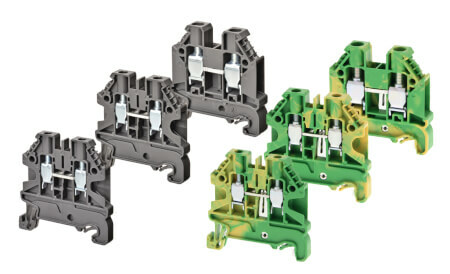 The extended family of XW5T Terminal Blocks with Omron’s unique Push-In Plus technology can be used for wider applications. 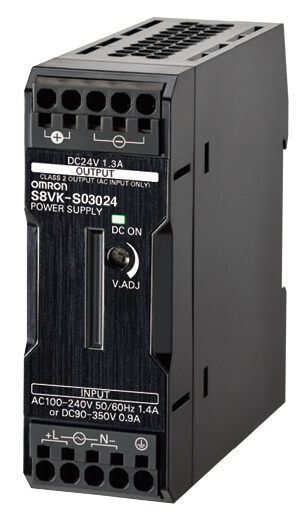 New 30-W model completes the S8VK-S series. The wider line-up of the S8VK-S series answers the needs of small capacity systems in addition offering space saving and swift customization. Environmental resistance, one of the main strengths of the S8VK-S, is in line with the entire series (ambient operating temperature range of -40 to 70°C and others) for stable operation in various environments. With its slim shape and high-precision liquid leakage detection, the K7L series has been utilized in a wide range of fields including semiconductor production equipment and building automation. Its self-diagnosis function safely detects disconnection of sensing bands (sensor part) as well as liquid leakage by a PNP output signal, which prevents unnecessary facility failure and breakdown.